A Channel 7 helicopter flies over the small town of Yarloop, after an out of control bushfire with record high winds devastated 95 homes and other constructions. Watch this video of the small town in our south-west as a bushfire hits. At the time of this video the neighbouring towns were under threat with high winds and 40 degree temps. The wait is over Bushfire BAL area map is now open to public. 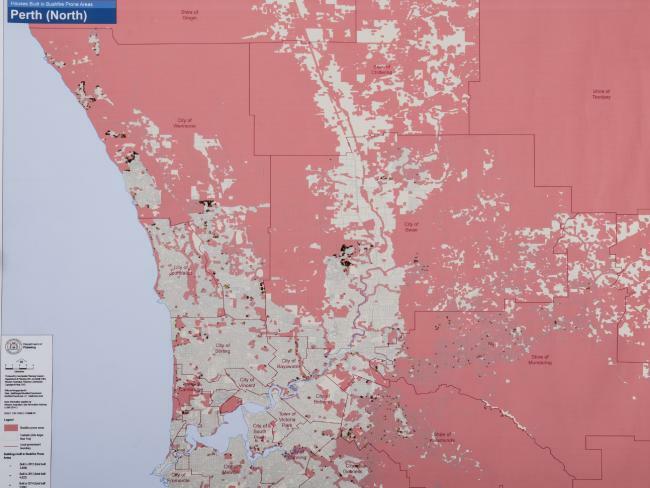 And new data shows nearly 12,000 buildings have been erected in high-risk areas such as Ellenbrook, Atwell and Wandi in the past three years. The Map of Bush Fire Prone Areas categorizes land that is within the deemed bushfire as designated by the West Australia government. 71 homes destroyed and a further 39 damaged. A report into the Perth Hills Bushfire. The Auditor General noted that dangers connected with major bushfires are increasing, including due to differences in land use due to urban sprawl with housing estates extending into bushfire prone areas. He also commented that greater fuel levels are contributing to a greater risk than ever before. The Review Committee noted agencies would check at the beginning of the fire season on fuel reduction plans in high risk areas and prepare State level action and an agreed controlled burning policy. Under the Local Government Act 1995 local governments may state all or parts of their states to be bushfire prone area. A designated bushfire prone area is defined under the National Construction Code (formerly known as the Building Code of Australia) as land nominated as being subject, or possible to be subject to, bushfires. Under the Construction Code, areas chosen as bushfire prone are required to meet a set of requirements. These requirements can be met through complying with the Australian Standard AS3959-200926. This standard prescribes construction standards for buildings founded on an BAL assessment of expectant radiant heat exposures. The necessities of some construction in bushfire prone areas specified in AS3959-2009 aim to increase resistance to bushfire attack from radiant heat, burning embers, flame contact and mixtures of the three occurrences. Some appearing before the Special Inquiry were anxious that an announcement of a bushfire prone area would mean building standards would have universal application. However, as the exact construction requirements depend on the assessable bushfire attack level, not all buildings need to be affected. This means that whilst a house could be in a bushfire prone area, the requirements will only apply except if the property has a certain BAL Rating. The report lists 55 recommendations and can be found in the link below.